As Joe Dunckley has noted in a recent post, The Department for Transport’s Local Transport Note 2/08, Cycle Infrastructure Design, is a curiously muddled-headed document when it comes to off-carriageway provision. While ostensibly a prescriptive document, one that should tell us how things should be done, LTN 2/08 essentially shrugs it shoulders and gives up when it comes to the matter of cycling on paths and tracks away from motor vehicles. 1.3.2 The road network is the most basic (and important) cycling facility available, and the preferred way of providing for cyclists is to create conditions on the carriageway where cyclists are content to use it, particularly in urban areas. 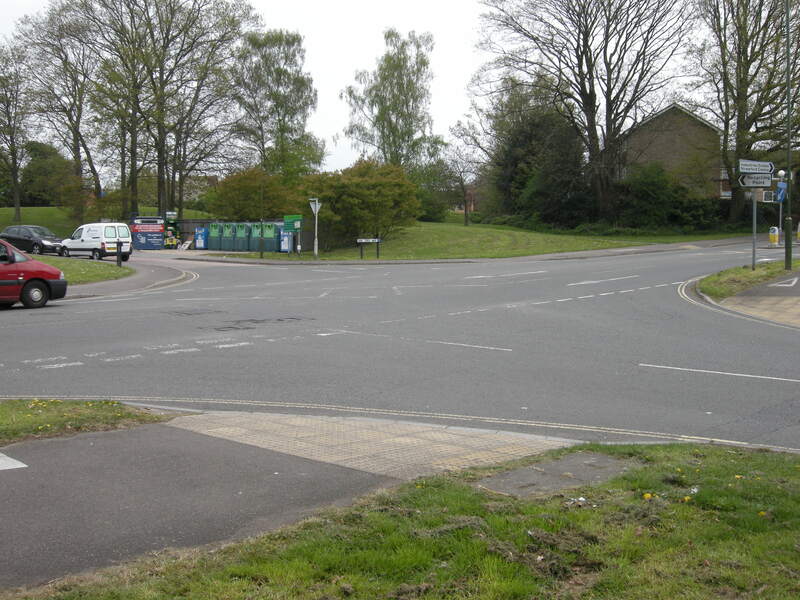 There is seldom the opportunity to provide an off­-carriageway route within the highway boundary that does not compromise pedestrian facilities or create potential hazards for cyclists, particularly at side roads. This is because they are pavements, and the authors can’t, or won’t, think of any other way of accommodating bicycles away from motor traffic beyond putting them on these shared-use pavements. Bicycles and pedestrians share this space; there is no separate pavement for pedestrians. The very low volume of foot and bicycle traffic in this semi-rural location means that conflict is minimal. Note also that this is explicitly a cycle path that has proceeds directly, with priority, across junctions, rather than a pavement with kerbing that yields at junctions. Not at all appropriate. 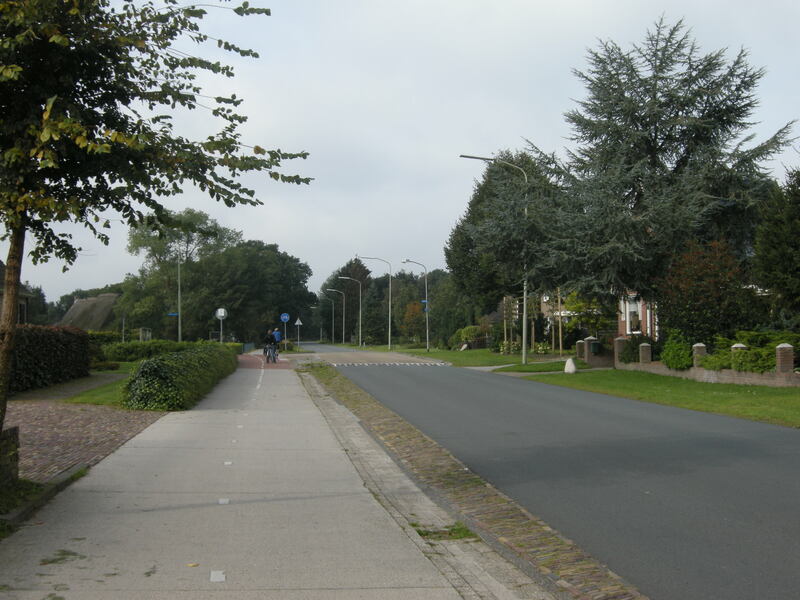 (This is, incidentally, a location which is not analogous to the Dutch example; it has reasonably high footfall, and is also a busy (sub)urban street on which dedicated segregated provision for bicycle should be the preferred solution). This brings me, in a roundabout way, to today’s cycling facility, which is an off-carriageway shared-use path in Horsham – Furneaux Walk. 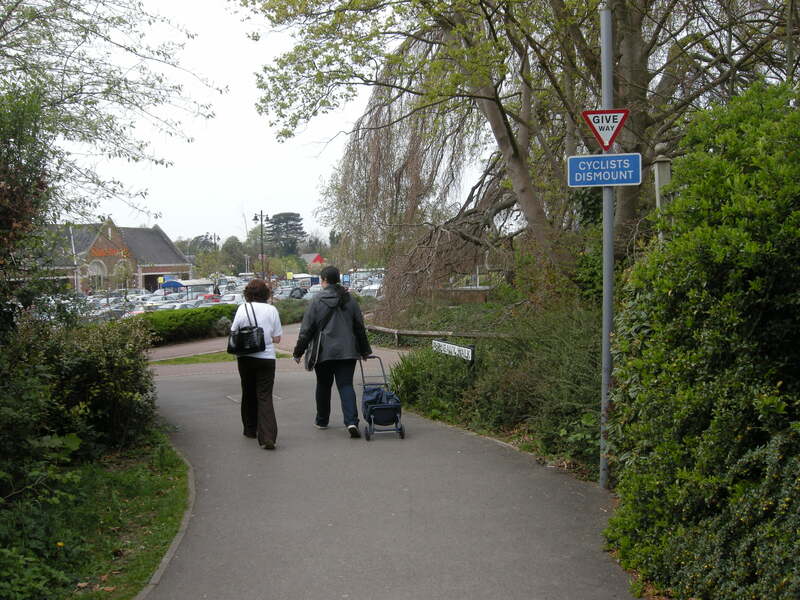 It looks like a walkway, and feels like a walkway, but of course it isn’t – it’s a shared-use path, one that runs alongside a recent shopping/residential development to the south of Horsham town centre. The post at the left used to have a blue sign indicating that this was a shared path; it has disappeared, making Furneaux Walk look even more like a Walk than before. It could have been done properly; instead it is rather inadequate. The first, and most serious problem, is that this is not a path on which there are very few pedestrian movements, a necessary condition for appropriate shared-use. 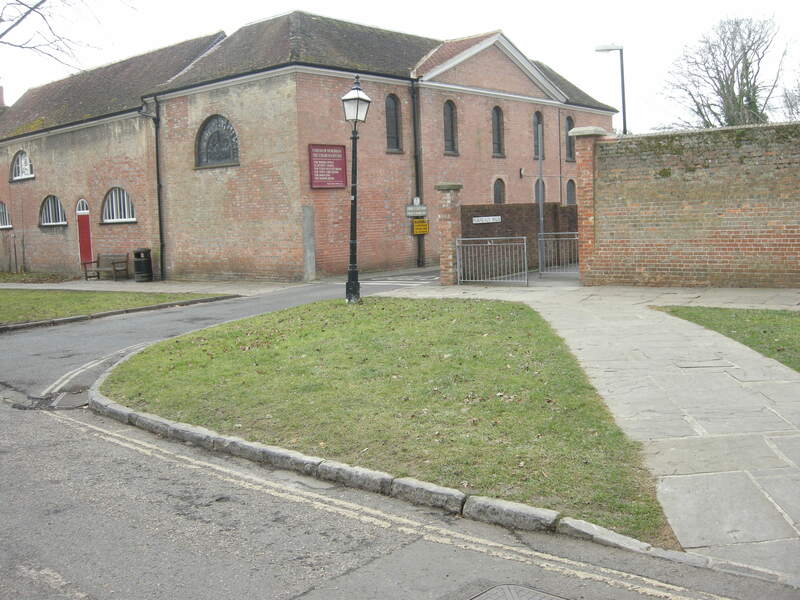 It is, instead, rather popular, being a shortcut to a Sainsbury’s supermarket, and to the town library, and to the handful of shops in the new development. I do use this path occasionally, and I do so very carefully, because you are almost certain to encounter pedestrians on it. Despite being the stipulated 3 metres in width, conflict between pedestrians and cyclists is liable to happen, partly because pedestrians don’t expect cyclists to be on this ‘Walk’, and partly because cyclists who are less careful than me might cycle inappropriately fast. These are problems that could have been addressed at the design stage, with a separate track for cyclists, and pavement for pedestrians, but they haven’t been, probably because the guidance is, as Joe has written, totally inadequate. The net result is a compromise that isn’t particularly good for either party. In the background, we see the supermarket towards which these two ladies are walking, side by side, blissfully unaware of my approach. In any case I am already ‘dismounting’ as I prepare to cross a footpath, before remounting a metre later as the shared-use path continues. Here we can see the western end of this same path. Do not let the markings fool you into thinking this is a bi-directional cycle path; cyclists are expected to travel, in both directions, to the left of the white line, while pedestrians are expected to keep to the right of it. The paint is a token gesture, a tacit recognition, perhaps, that this section of the path has a high number of pedestrians and cyclists on it, and that some attempt should be made to keep them separate. Of course it cannot really do this, because the path is too narrow for the volume of movements along it and across it. Flawed from the outset. Returning to the eastern end, we see more bodging. As the path emerges onto the Causeway road, we of course have to have some railings to interrupt bicycles, because the path was not designed in the first place to accommodate cyclists travelling at more than walking speed. 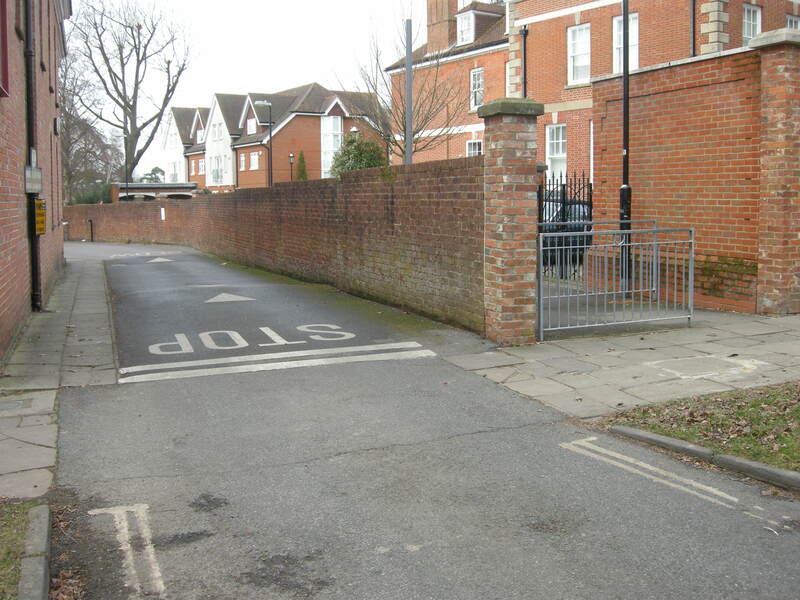 We are crossing a pavement here, and there is a visibility issue caused by the brick walls on either side; that is why the railings were thought necessary, to stop cyclists whizzing out into pedestrians walking from left to right. But this is really hopeless on several levels. 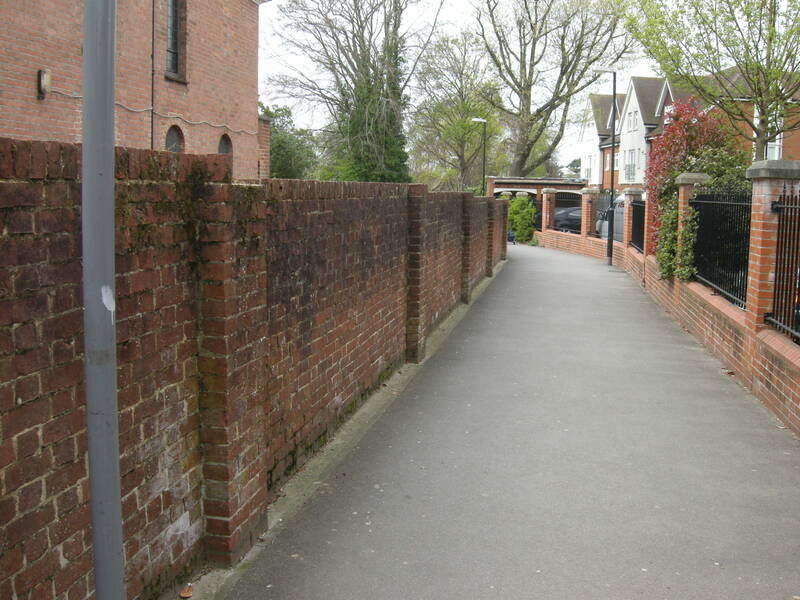 For a start, the brick wall on the left was built at the same time as the path; they form part of the same development. 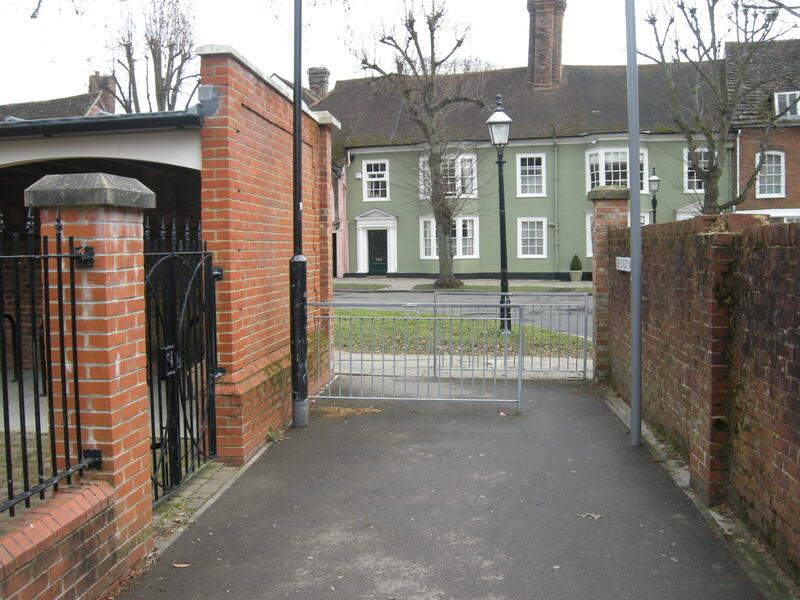 (Ironically, the brick wall is a cycle shed, which contains… no bicycles.) The visibility issue could have been partly addressed during construction. Looking from the other direction, we have a direct, side-by-side comparison of how poorly bicycles are planned for, compared to motor vehicles. The shared-use path emerges at right; a road from a car park emerges at left. Both appear from behind brick walls. Drivers are trusted to stop at the markings by the pavement, and to look for pedestrians before they continue (in practice they quite often do not). Cyclists cannot be similarly trusted, and so are forced to zig-zag their way through railings. Drivers have direct access from the entrance to the road. Cyclists do not; they have a footpath which they are not allowed to cycle on. 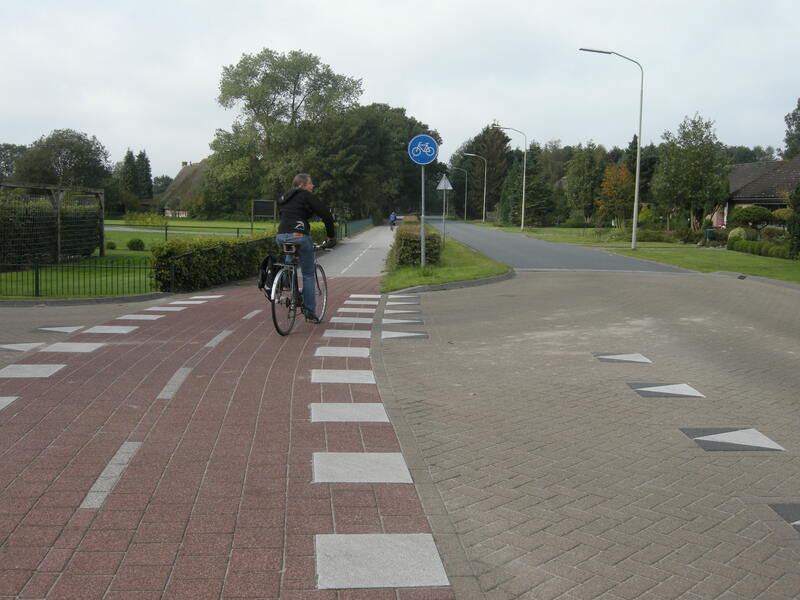 The best option is to wiggle right again, having zig-zagged through the railings, onto the tarmac road – cycling for a short while on the pavement. These might seem like minor quibbles, but remember this was a new development – an opportunity to get things right. Instead it’s more than a bit half-arsed, and worse, it’s allowed to be, because the guidance is so anaemic. 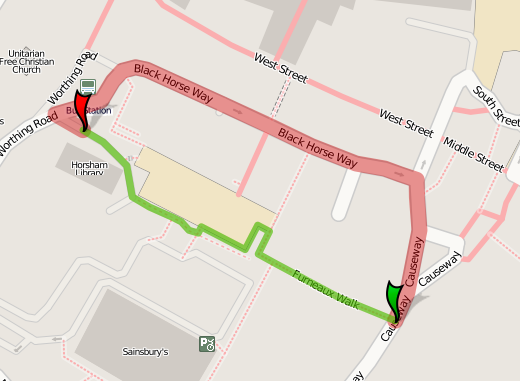 Starting from the Causeway, where the photographs immediately above are taken, we find that the quickest way of arriving at the end of this path (marked out as the green line) is not to use the path itself, but to cycle north to the adjacent Blackhorse Way, and to cycle on that road instead, which is not ideal, being fairly heavily trafficked with motor vehicles, especially lorries delivering to the shops in the town centre (indeed Cyclestreets describes the quiteness of this road as ‘very hostile’, which is something of an exaggeration, but it can be a particularly intimidating canyon). So we have a ‘dual network’, a substandard cycle path appropriate for novices and the nervous, and a road network that competent cyclists will use, in preference, because it is quicker. Indeed, quicker cyclists have been ‘designed out’ of Furneaux Walk, even though it forms the most direct route. This is actually facilitated and encouraged by LTN 2/08. It is no way to privilege bicycle use in our towns and cities. This entry was posted in Department for Transport, Friday facility, Horsham, Infrastructure, The Netherlands, Town planning, Walking. Bookmark the permalink. I have encountered some of those lovely railing chicanes on a route I used to use to head out towards Surbiton (although this was at the MItcham end…) right PITA and completely un-usable if you had a trailer or non-standard bike. On that particular route there was one spot of rather handy bike infrastructure/path provided a nice little cut through in a park and provided a vital link in the ride. It actually had seperate bridges to cross a small river 🙂 It was only about 3-5m in length but on a few occasions I did encounter pedestrians (sometimes with dogs) using the bike bridge despite the pedestrian bridge being not much more the 1-2m to the side! Another great example of the non-contiguous, MUST YIELD TO CROSSING TRAFFIC bikes lanes is the on-pavement bikes lanes around Vauxhall, specifically the ones that run outside Tesco and George’s Wharf. For each entrance to the buildings the bike lanes have yield/give way markings. Like it would such a nuisance for motor traffic to have to allow bikes to pass first…. I’m not sure it is appropriate for anyone really. Looks like a good way for cyclists, novices or not, to crash into each other and pedestrians. 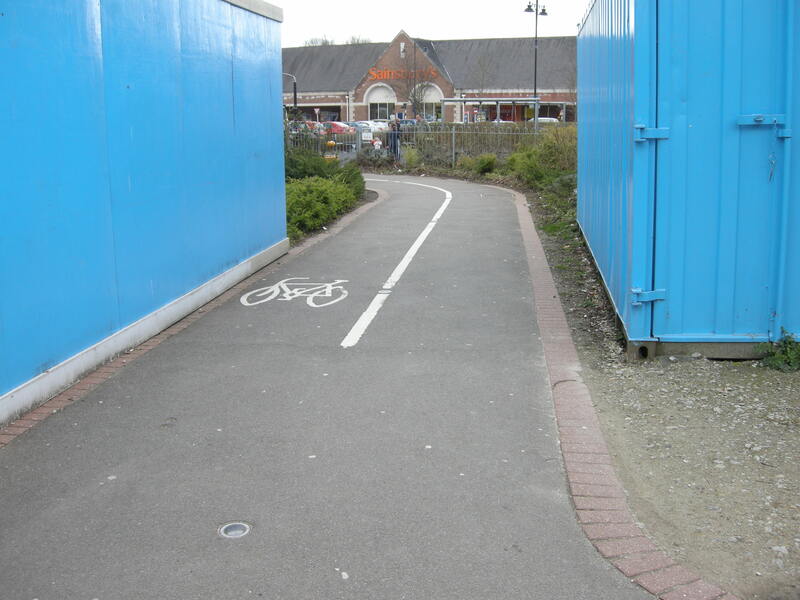 You comment that shared use paths can sometimes be appropriate, where footfall is low. I can think of a good example in my own neighbourhood, where a footway running alongside the A3 between Thursley and Milford, Surrey, could with relatively little effort or cost be converted into a shared-used cycle path. David Hembrow comments on this particular stretch of road in a post of his from last Autumn, and notes that Thursley to Milford could easily be cycled as the distance is modest (perhaps 4 miles) and the terrain quite flat, but the A3 is a very hostile environment for cyclists. In fact, the footway I refer to is actually a shared use path of about 2-2.5m width, for the first kilometre of the 3 km distance between the Thursley and Milford slip roads. After that 1 km however, it just has a sign “End of Route” – right in the middle of nowhere – and carries on as footway only. A classic British cycle facility, not so much crap quality as not having a useful destination or origin. Now, the opening of the Hindhead Tunnel on the A3 has led to the creation of a fairly good quality (by UK standards) quiet road or off-road cycle route which links the tunnel entrances/exits at either end. This was not done because the Highways Agency likes cyclists, oh no, it was in effect a statutory obligation – the tunnel is prohibited to all vehicles other than motor vehicles and motorcycles over 50cc, therefore an alternative route must be provided for the cycles, mopeds, horses etc which would otherwise have been entitled to use the tunnel. Not, of course, that any sane cyclist or equestrian ever uses the A3. It would be soooo easy to make this route extend, from Thursley to Milford, so that the villagers of Thursley, Hindhead etc could access their local market town, Godalming, and its railway station, by bike. At a bare minimum, the other 2km of footway could be designated shared use and widened. It crosses two side-roads, but each only serves an isolated farm so conflicting traffic is almost non-existent. It is already kerb-separated and has a small grass strip between it and the road. It could be surfaced out to a 2m width from the current 1m, for minimal cost. That is clearly not a standard we would wish to aspire to long-term, but bearing in mind that I have personally NEVER seen anyone walking on the footway, and can’t imagine why anyone would, it would be a cheap way of testing a concept – bulid it and they will come – and if it becomes popular it would make the case for upgrading it. What do you reckon the response of the Highways Agency was? Firstly to ignore me, then to say it would cost too much (this after the £376 million Hindhead Tunnel, about £90m per mile for the new stretch of road it created, had been built). My MP, Jeremy Hunt, has offered to take it up with the Highways Agency so when I get my act together and prepare my response to him, it will be interesting to see where it gets me. I’ve ridden along the path you describe a number of times – and difficult it is too. How come we have no decent cycle routes across the centre of Horsham? East to west, north to south – none are straightforward, so no wonder we keep to the roads or pavements.